Business Catalyst is an all-in-one business website and online marketing solution. Developed and created specifically for web designers, Business Catalyst offers a unified platform without the back-end coding. If you are a web designer, you can create everything from amazing websites to powerful online stores, and beautiful brochure-ware sites to lead generation mini-sites. Business Catalyst represents a solid fusion between a powerful SaaS (software-as-a-service)-based content management system and a top class website builder. The platform delivers tons of integrated functionality, making it a viable option to consider for those who are searching the market for a cloud-hosted web building solution without a heavy price tag. 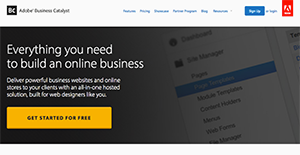 In a nutshell, Business Catalyst is a powerful website builder that comes with a rich feature set, including elements of CRM, e-commerce, mailing list management and tons more. It offers a friendly construction that makes it navigable for a novice, yet powerful enough for an advanced user. Business Catalyst does more than just help web designers and website builders start a website; the system provides them with capabilities and tools to help them meet the demands of their clients – an effective avenue for their online business that offers more functionality and drives better results. Things that simple websites can never accomplish. With Business Catalyst, it is easy to achieve higher profits than ever without raising the costs. The system offers automation features that eliminate the need to manually integrate systems or maintain tens of plug-ins to meet a single client’s demands and requirements. Business Catalyst effectively reduces development time and streamlines workflows. The software encourages creativity and provides the tools you need to build beautiful websites the way you want them. While other products stump your creativity with complicated or restrictive theme systems, you have the freedom to craft your own websites in HTML and CSS, and then simply insert their modules on top. If you are interested in Business Catalyst it might also be sensible to investigate other subcategories of Best eCommerce Software collected in our database of SaaS software reviews. There are trendy and widely used systems in each software group. But are they essentially the best fit for your company’s specific needs? A trendy software solution may have thousands of customers, but does it present what you need? For this reason, do not blindly spend on popular systems. Read at least a few Business Catalyst reviews and think about the aspects that you wish to have in the software such as the price, main tools, available integrations etc. Then, select a few apps that fit your requirements. Check out the free trials of these products, read online opinions, get information from the maker, and do your investigation meticulously. This in-depth groundwork is sure to aid you find the finest software application for your organization’s specific wants. How Much Does Business Catalyst Cost? We realize that when you make a decision to buy Shopping Cart Software it’s important not only to see how experts evaluate it in their reviews, but also to find out if the real people and companies that buy it are actually satisfied with the product. That’s why we’ve created our behavior-based Customer Satisfaction Algorithm™ that gathers customer reviews, comments and Business Catalyst reviews across a wide range of social media sites. The data is then presented in an easy to digest form showing how many people had positive and negative experience with Business Catalyst. With that information at hand you should be equipped to make an informed buying decision that you won’t regret. What are Business Catalyst pricing details? What integrations are available for Business Catalyst? If you need more information about Business Catalyst or you simply have a question let us know what you need and we’ll forward your request directly to the vendor.